Preventing dust adhesion with Fog - IKEUCHI EUROPE B.V. Stopping dust adhesion is a two-step process consisting of reducing the number of dust particles and neutralizing the remaining particles. Neutralization is achieved through humidification and dust suppression. Humidification: Dust sticks to an object due to its micro-structure, the viscosity or by an electrostatic charge. 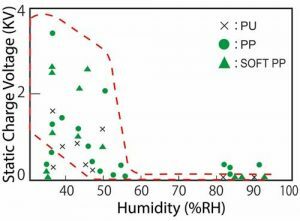 By controlling the relative humidity, the conductivity of the air is increased and prevents dust from sticking to an object due to an electrostatic charge. Dust suppression: In facilities other than clean rooms, airborne dust is impossible to fully avoid, even when using over-pressure. By spraying non-wetting water droplets, the same size as dust particles, we can suppress the dust particles and avoid these particles from reaching specified objects. 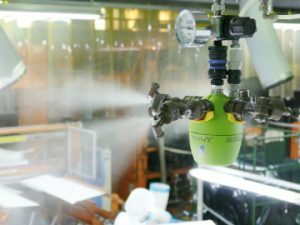 AirAKI® Industrial humidification system, it sprays Dry Fog with an average droplet size of 10μm or less. BIM series Pneumatic nozzle, BIM nozzles produce extremely fine droplets ranging from 10 to 100 μm. We can adapt to a wide range of operating conditions. Hydraulic systems with hollow cone spray pattern nozzle For preventing dust adhesion, our hollow cone series (KB, KBN, LYOHM unit) sprays extremely fine fog and ultra-small capacity without using air.